Allis Roller was asked by playground manufacturer, BCI Burke, to develop rollers for their proprietary Roller Slide design. BCI Burke chose Allis Roller because of their location in Wisconsin and willingness to collaborate with BCI Burke’s engineers in creating rollers for an outdoor playground application. 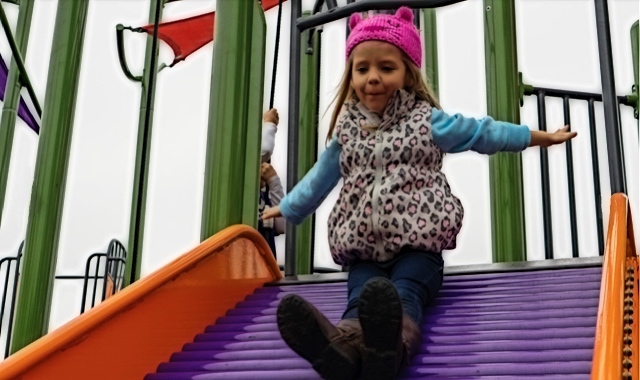 Though roller slides are not new to the playground equipment market, they are rising in popularity due to an increased demand for diverse, more accessible playground equipment. Roller slides are particularly accommodating for children with cochlear implants because of their static-free nature, and also provide a unique, tactile sliding experience for children. BCI Burke also offers the longest and strongest warranty in the industry, making product longevity an essential feature of the finished rollers. In order to remain consistent with their industry-leading standards, BCI Burke required exceptionally durable, high quality rollers capable of withstanding outdoor exposure for their Roller Slide design. BCI Burke also goes to great lengths to provide corrosion protection for all playground equipment, which includes pre-treatment and a multi-step powder coating process that BCI Burke completes in-house. In order to allow for this complex coating process, additional transport back and forth between Allis Roller and BCI Burke midway through the manufacturing process was required. Allis Roller’s machining and assembly process needed to accommodate these additional steps while still allowing BCI Burke to fulfill orders efficiently. The machining and seal assembly processes that Allis Roller incorporated into the manufacturing of BCI Burke’s rollers prevents dirt and debris from entering the roller and degrading it over time. Given that Allis Roller already had previous experience in machining these types of complex rollers for industrial applications, their team was able to effectively adapt the process to accommodate BCI Burke’s Roller Slide. This feature helps maintain the longevity and functionality of the Roller Slide even as it is exposed to dust, dirt, and the elements, making it an ideal solution for outdoor playground equipment applications. Allis Roller was also responsible for assembly, and utilized precise equipment for the pressing of bearings into BCI Burke’s completed rollers, which is a difficult process requiring a significant level of expertise. Highly skilled machinists at Allis Roller were able to achieve the right press fit without pressing too tight, or too lightly, and still allowing the bearings to turn. The result produced high quality rollers that met BCI Burke’s industry-leading standards in playground equipment quality. The need for BCI Burke’s specialty coating process presented logistical problems that extended lead-time estimates beyond what customers typically expect. In order to allow for this coating process at BCI Burke without necessitating excessive transport back and forth, Allis Roller worked with them to create a unique logistical solution. The rollers were machined and pre-coated with a dichromate corrosion protectant by Allis Roller, and then shipped to BCI Burke for storage. Once an order was placed, BCI Burke could powder coat the rollers immediately and send them to Allis Roller to be assembled. After assembly was completed by Allis Roller, finished components were transported back to BCI Burke for final packaging and shipment to the customer. With each of these steps, Allis Roller helped produce the high quality, durable rollers BCI Burke required without having to extend lead-times or cut corners. For additional information on complex parts machining like the uniquely durable rollers used in the BCI Burke Roller Slide, visit our Contact page to connect with one of our experts. Our mission is to bring Play That Moves You to communities around the world and connect people through play. As we advance the Play Movement, we are driven to continuously design inspiring products and play environments to bring a higher level of play to the communities we serve. We provide a variety of playground, park and fitness equipment, including climbers, slides, swings, fitness equipment, site amenities, park furniture and sports equipment to Parks & Recreation, Municipalities, Schools, Daycare, Churches, Apartment Complexes, Childcare Centers and Children’s Museums. Join our movement at bciburke.com and see how play can move you!